Angels With Dirty Faces is the name of 1938 film, starring Pat O’Brien, Humphrey Bogart and James Cagney. 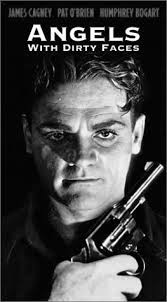 Cagney’s 1949 film, White Heat, also inspired the equally “killer” True Blue album track of the same name, which samples his dialogue from the film. Congratulations on the great blog! Thanks for comments - really glad to hear you're enjoying reading it as much as I enjoy writing and researching. Stay tuned for lots more! Hi Steff - thanks for the kind comments! You rock too I bet!